A native of La Rioja, Spain, and a Sony recording artist, Pablo Sáinz Villegas has become a worldwide sensation and one of the most exciting guitarists of his generation. 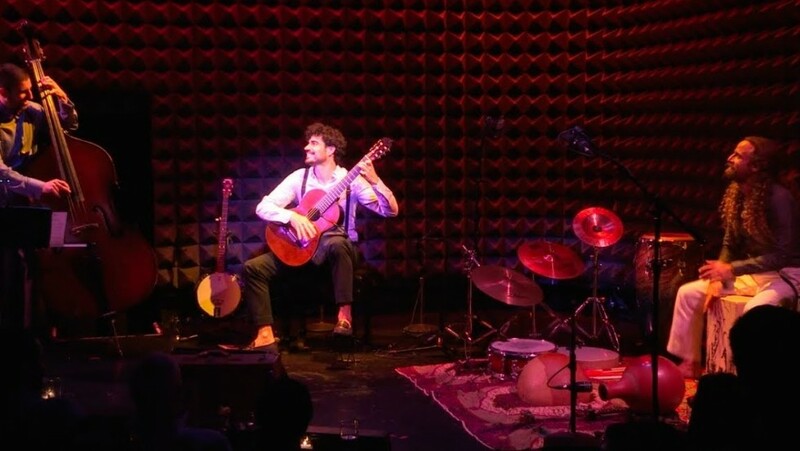 With his “virtuosic playing characterized by irresistible exuberance” (New York Times), his interpretations conjure the passion, playfulness, and drama of his homeland’s rich musical heritage. Runtime: approximately 90 minutes with intermission. Born in Rio de Janeiro to a bourgeois family, Heitor Villa-Lobos studied the cello formally but got much of his musical education on the street, as an amateur guitarist in chôro groups. Before samba and bossa nova, chôro was the defining popular music of Brazil: instrumental, improvisatory, and usually upbeat. That influence is felt in Villa-Lobos’s first published guitar works, the melodious and dance-oriented Suite Populaire brésilienne and Chôro No. 1. Following his father’s death, Villa-Lobos quit medical studies and supported himself playing cello gigs in hotels and silent-movie theaters. He traveled in the Amazon rainforest and northeastern Brazil, where he developed a passion for native and folk music, which left lifelong traces in his music. In the 1920s, he moved to Paris and reached fame through friendships with Stravinsky, Milhaud, Rubinstein, and Segovia, the dedicatee of the 1929 Twelve Etudes. The Etudes were not a quick hit (Segovia avoided playing all but one or two them) but are recognized now as lodestars of the modern guitar repertoire. Villa-Lobos returned to Brazil in 1930 for a conducting engagement, intending to return to Paris. He ended up staying in the country through the Second World War, years that aligned with the dictatorship of Getúlio Vargas. Over the 15 years of Vargas’s rule, Villa-Lobos grew close to the government, concerningly so to liberal opinion. Accepting the directorship of a national musical organization, he composed patriotic works, wrote propagandistic essays, and staged mass musical events, one of which featured 30,000 children singing the national anthem. Villa-Lobos’ last solo guitar work, the well-loved Five Preludes (1940), written during the Vargas period, feels free from political motivation, even as it exudes what Villa-Lobos would have called brasilidade (“Brazilian-ness”). He was not a virtuoso on the instrument, but understood it well as a player. His eccentric technique gave Segovia cause to raise his eyebrows: in addition to the four right-hand fingers normally used for plucking, he employed the pinky, a quirk some think responsible for the prevalence of five-note chords in his music. Luiz Bonfá grew up in a small village outside Rio de Janeiro. His Italian-born father encouraged him to take up the guitar. Bonfá acquired a fluid classical technique from early studies with the Uruguayan virtuoso Isaías Sávio, and gravitated later to popular styles. Bonfá was known to jam with Garôto, one of the great early exponents of the Brazilian guitar (and a member of Carmen Miranda’s band). After meeting Antonio Carlos Jobim and Vinicius de Moraes, the duo behind “The Girl from Ipanema,” among other epochal hits, Bonfá contributed several songs to their soundtrack for the classic 1959 film Black Orpheus. What might be called the official unofficial anthem of Venezuela, Alma llanera is a song known to all Venezuelans, and the only well-known composition of its creator, Pedro Elías Gutiérrez. Gutiérrez’ musical career otherwise included directing an orchestra and a marching band in Caracas, and composing several zarzuelas (operetta-like works), including the one in which Alma llanera was first heard, in 1914. The word joropo originally meant “party” but came to refer to a kind of Latin American creole music with Native American, African, and European influences. Joropo bears a resemblance to the Spanish fandango, likewise an up-tempo couples’ dance in triple meter. Until his untimely death to cancer in 2016, the Tunisian-born French guitarist-composer Roland Dyens resembled no one else in the classical guitar world: Parisian, wild of hair, and rarely without a cigarette, he was known for his concert improvisations, irreverent and virtuosic compositions, and sensitive, alert musicianship. A journalist once told him he had the hands of a classical musician but the mind of a jazz musician. Skäi is French slang for "pleather," so a Tango en Skäi is a tango made from cheap imitation leather: Dyens’ wry way of suggesting that this tango should not be taken too seriously, by the player or the audience. Dyens committed the piece, originally an improvisation, to paper at his publisher’s request in 1985, a year that just might be the high watermark of PVC as a clothing material. The most famous song of Cuba, Guajira Guantanamera is to its native country what Alma llanera is to Venezuela, perhaps even more so: the tune is so well known that many outside Cuba are not quite sure where it comes from. With lyrics by the poet of Cuban independence, Jose Martí, the song was recorded in 1929 by Joseíto Fernandez, a singer-songwriter who hosted a popular radio program. The song came to international renown in the 1960s through a recording by the Sandpipers, an easy-listening group, and has been recorded by a truly eclectic list of artists, including Joan Baez, Jimmy Buffett, Nana Mouskouri, Wyclef Jean, Tito Puente, and Pete Seeger; it was also used in the soundtrack of The Godfather II. The song’s title refers to a country girl, a guajira, from the province of Guantánamo who fails to reciprocate the speaker’s affections. The Paraguayan guitarist-composer Agustín Barrios left a remarkable body of some 300 guitar pieces that sat ignored for much of the twentieth century, until guitarists in the 1970s, particularly John Williams, began to champion his work. Today Barrios is as central a figure in the guitar literature as Villa-Lobos, though Barrios was decidedly not a modernist. He was something more like a Latin American response to Spain’s Francisco Tarréga. In the 1930s, a time when Andrès Segovia was already feted on multiple continents, Barrios was compelled to be his own one-man self-promotion machine. His fanciful efforts to capitalize on his native Paraguayan background, touring Europe as “Nitsuga Mangoré, the Paganini of the Guitar from the Jungles of Paraguay,” strike one today as somewhat pitiable: he concertized in a feathered headdress, borrowing the name Mangoré from a Guaraní chief (Nitsuga was Agustín, reversed). A Barrios recital might include original works, improvisations, guitar works by Sor and Tárrega, and transcriptions of pieces by Bach, Albéniz, Chopin, and others, played with what surviving recordings attest was an impressive virtuosity. Un Sueño en la floresta (“A Dream in the Forest”) is one of Barrios’ longer and lovelier pieces, a late-Romantic excursion whose gentle, lyrical introduction leads into an extended tremolo section, interspersed with lyrical interludes and seductive changes of key. The piece’s loose-knit, episodic structure seems to take its cues from late nineteenth-century piano works, for instance those of Franz Liszt. The year 2018 marked what would have been the hundredth birthday of Leonard Bernstein, that son of Massachusetts (and of a Ukrainian-born hairdressing supplies wholesaler) who went on to have the greatest classical-music career in twentieth-century America. Irrepressibly curious, the young Bernstein relished the intellectual expanses of Harvard, where he wrote his senior thesis on “The Absorption of Race Elements into American Music.” After studies at Curtis, Bernstein was a lifelong New Yorker, not counting summers at Tanglewood and endless touring. He died, like, John Lennon, at the Dakota building, in the apartment where Bernstein and his wife Felicia had famously displayed their political daring by hosting a 1970 party for the Black Panthers. Bernstein’s importance stemmed from his legendary directorship of the New York Philharmonic (where he led the beloved Young People’s Concerts), his leonine charisma at the podium, and his championing of works by Mahler and Ives, composers whose former obscurity now seems hard to imagine. It also came, of course, from his compositions: works like Candide and West Side Story, which managed, with their intelligence and musical attractiveness, the unique trick of pleasing cognoscenti and the public. West Side Story transposes Romeo and Juliet from Verona to a long-lost, pre-Lincoln Center Upper West Side of gangs and immigrants. Tony, an associate of the white Jets, falls in love with Maria, sister of Bernardo, leader of the Jets’ Puerto Rican rivals, the Sharks. With a book by Arthur Laurents and words by Stephen Sondheim, the show opened on Broadway in 1957, only a few years after Bernstein had been blacklisted by the State Department for supposed Communism. The show succeeded in spite of its focus on uncomfortable social issues and its sophisticated music. The opening notes of "Maria" are still sounded in ear-training classes to teach the augmented fourth, the tritone, so rare is that melodic interval. "I feel pretty" and "America" round out a selection of some of the best-known tunes from the musical. The Venezuelan composer and guitarist Antonio Lauro studied piano, composition, and guitar as a child in Caracas. He was fond of valses venezolanos, a genre of syncopated waltzes that had been popular in parlors since the colonial days of the nineteenth century. His compositional style put him on what he called the Calle Real: a musical Main Street that avoided too many wayward harmonies. If Lauro’s aesthetic was traditional, his belief in democracy was outspoken enough to get him jailed for several years in the 1950s, during the military junta of General Marcos Pérez Jiménez. Lauro appeared to take the sentence in stride, continuing to compose in prison. 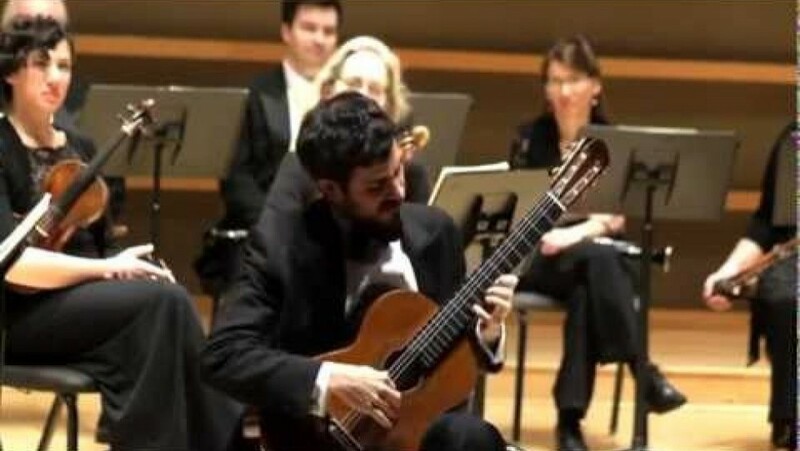 His works became known internationally through the attentions of Alirio Diaz, a distinguished Venezuelan guitarist who advocated for them, reaching the ears of Segovia, John Williams, and Leo Brouwer. Lauro himself toured as a guitarist late in life, giving a well-received recital at Wigmore Hall in London in 1980. His popular piece Seis por derecho is, like Gutierrez’ famous piece heard earlier, a joropo, in this case one meant to emulate the sound of the Venezuelan harp. The title of this festive dance, a seis, can be read as a play on “six”: the time signature of 6/8 (toyed with by hemiolas throughout) and the six strings plucked by the right hand.